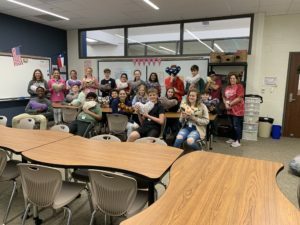 Students in the Team Leadership Class at Tays Junior High School in Katy, Texas, stuffed 140 pillows for Common Thread in February! This was part of their service to the community. 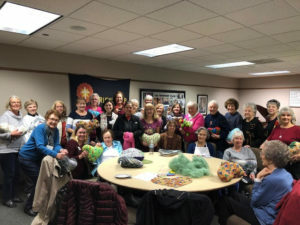 Joan Garofalo, a member of Common Thread, made the arrangements. She is pictured below with her granddaughters. 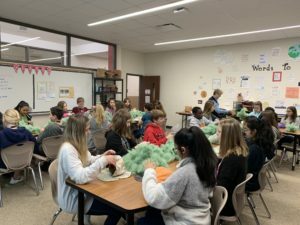 Common Thread Circle will meet on Mondays, March 4, 11, 18, and 25th, from 2-4-p.m. at Memorial Drive United Methodist Church in Room D100. 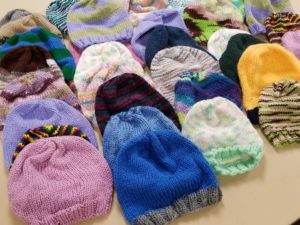 Happy Hands will meet on Wednesday, March 27th, from 9:30-11:30 a.m. at Spring Branch Presbyterian Church. 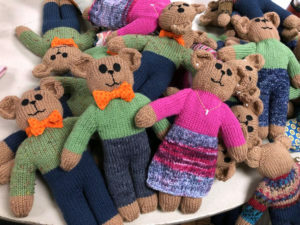 Look at all the teddy bears knitted by Judy Aycock for Common Thread Circle! Janie, Joyce and Joan, members of Common Thread Circle, present a teddy bear and one of Common Thread’s “critters” to a new grandpa, Dr. John Robbins, Senior Minister at Memorial Drive United Methodist Church! 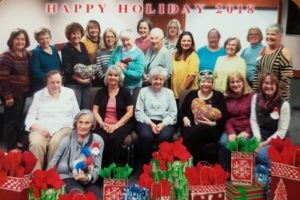 To show them how much they are appreciated, all the members of Common Thread Circle joined together in giving our leaders, Marilyn MacRill and Janie Schmidt, gift cards for Christmas. 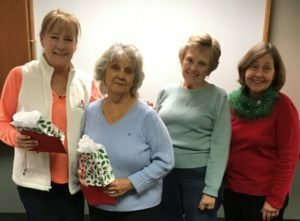 Georgia Kimmel and Mary Lu Mase presented their gifts to them at the last meeting in December. We are no longer meeting on the third Tuesdays, as the UMW Common Thread Circle is now meeting with the former Monday group that started at Town & Country Starbucks a number of years ago. 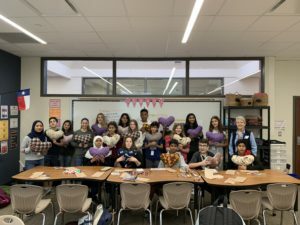 If you would like to help us make the heart-shaped comfort pillows, the little stuffed animal “critters” for children’s wards, the knitted or crocheted hats and scarves for cancer patients (or any of the many items shown on this website) you are welcome to join any Monday afternoon! Our first meeting in January will be on Monday, January 7th. 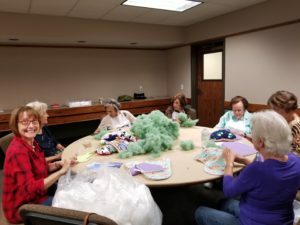 On November 12th, Jennifer Buck and her assistant, Kathy Walker, paid a visit to the Common Thread Circle meeting at Memorial Drive United Methodist Church. 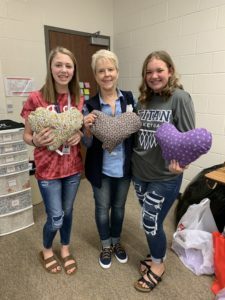 We deliver our heart-shaped comfort pillows, our little stuffed animal “critters” and our other handmade items regularly to the Harris Health Systems at Ben Taub Hospital in the Med Center. They then distribute them to their patients at their many facilities around the Houston area. 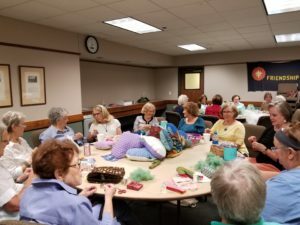 Kathy thanked everyone and shared with our members how much their patients appreciate the love and work that goes into the handmade items. They shared two messages they had received.